I like bread. Now this is a very plain boring statement. I like good bread. Sounds better. But what makes good bread? I like the fragrance of fresh bread out of the oven, which reminds me of memories walking by bakeries. I like rustic looking bread. I needed to make my own bread. If I still lived in France, there would not be a good reason -maybe- for this post. There would not be any good reason for me to go through the trouble of making my own bread, except for that silly pride that pushes me to want to cook certain dishes and say I made it ( C’est moi qui l’ai fait!). I think I can be a bit obsessive about this but never mind, the point is that I enjoy the whole process: Making, Smelling, Tasting. In France, you find bakeries lined up the ones next to the others. Some are specialized and/or known for des spécialités. In Paris, Pain Poilâne on rue du Cherche Midi is a famous bakery, known for its old-fashioned baking. And to my surprise, I recently discovered that you could order Pain Poilâne on line. Now this I am afraid I find c’est un peu pousser le bouchon (it is a bit over the top). Why would you need to order bread? It is not like there is a shortage of good bakers. In Paris and generally everywhere in France, getting good bread is really an easy piece of bread cake. Here in the USA, the story is slightly different. In Boston, there are a few good bakeries. I like HiRise, Sel de la terre the restaurant with its own boulangerie and Formaggio’s where they sell breads from different sources, including Pain Poilâne! True! Now to me, this is pousser le bouchon un peu trop loin (really over the top). I mean, that is saying that the bread is going to sit in a plane for a minimum of 7 hours, not counting the time spent to package it, load and unload it, then have it transferred to Formaggio’s before being placed on the shelves ready to be sold. Isn’t the whole point of eating a bread like Pain Poilâne to have it 200% fresh? I needed to find a good way to fulfill my crave for good breads, whose smells I missed so much. I was well decided not to fall in the trap to go to Formaggio’s to buy Pain Poilâne and so one day, following a good friend’s advice, I decided to make a good purchase. I now own a bread machine. Quelle horreur! Am I saying I do not make my own bread working the dough with my 2 hands? I occasionnally do this, but I have to admit that having a bread machine is like creating a green house for your dough. You are creating the perfect environment for your dough to rise. That been said, I use the bread machine to mix the ingredients and rise the dough, then I have the dough rise again at room temperature before shaping it in the form I like before the final step, that is cook it in the oven (450F). Disadvantage: It takes space on my kitchen countertop but this is minor. I highly recommend this item. Maybe you have a gift certificate that needs to find a home? No need to add that I never regretted this purchase as I use the machine at least 3 times a week. To rise the dough, I use La Cloche Brick Oven, which is just perfect to give nice brown crusts. One of the things I love about this purchase is that I can have bread ready when I want, without needing to go to the bakery across town (get in my car, fight with Boston drivers grgrgr, park the car if I am lucky to find a spot, get the bread after waiting in line, get in traffic again before getting home, transformed into a grumpy creature). When the bread cooks in the oven, it just fills the house with a scent that cannot be described unless experienced. 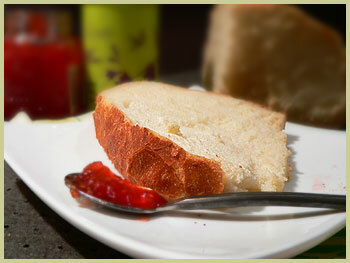 Nothing beats dipping a fresh slice of homemade bread in a fragrant sauce, non? A real ultimate pleasure. Just delicious! I love HiRise – used to go there all the time when I lived in Cambridge. Another good bakery is Iggy’s, which is located in Cambridge in the Fresh Pond area (they do sell to local markets, but it’s always better straight from the original source). And there is lots of parking! If I could send you the aroma I would! 😉 A few years from now and we might be able to do that! ah! Yes Iggy’s is good too, you are right. Thanks for mentioning it. I used to live close to their bakery in Watertown but they moved. There is now a Danish bakery at that same address. But Wholefoods carries Iggy’s bread. I have to say though, I still prefer Hiise, OR Sel de la Terre baguette which is just succulent! If you ever get as far South as Roslindale (or even JP) you should really try Fornax. They do an excellent assortment of No. Italian rustric breads, with a few odd balls extras thrown in. Best bread in Boston. Good to know that Zoji makes bread machines, they also make the only drip coffee maker worth owning. Very nice! Thanks for the tip Kellan. I will certainly check it! I had never heard about it. Aha! I am glad I was able to convince you that a bread machine was not a “cop out” but a completely worth it convenient short cut for our busy lives! Now- I need to do what I have wanted to do for ages– get La Cloche Brick Oven. I have been meaning to buy one since my part time days at Williams Sonoma. 16 years! 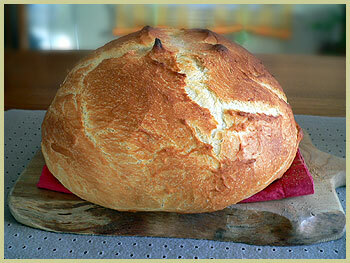 It will be perfect for the Campagne bread and this Spanish bread I make. It is the only way for the home baker to get that divine crust your bread has. Your photo convinced me! Thanks! Hi Bea, I just discovered your blog from Foodography and wanted to say how much I love your photography! What a beautiful lookin’ bread!!! I haven’t read the posting bcoz I drooled everywhere before I could. Is it possible to make it solely by hand? F.A.O Samir Andrawos – have you managed to get any further with the opening of your boulangerie? i was doing some research myself as its something myself and my partner are most interested in doing in R.Of Ireland…and was wondering how you sourced your information? like you, were willing to pay for it. Any advice etc would be very much appreciated – feeling totally overwhelmed/clueless about the whole thing!! Pourriez-vous me dire si on peut trouver cette cloche en France. Cordialement. Shantala. 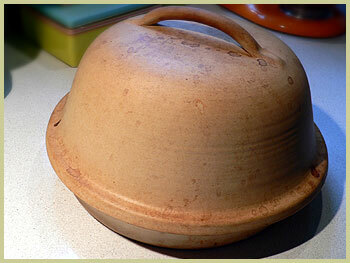 I love my la cloche–it makes the best bread! but, I’ve had mine up on a shelf for over a year. I need to get it down and start using it again The crust on the bread is fabulous, isn’t it? Je ne suis malheureusement pas sure. En faisant quelques recherches, je n’ai pas trouve grand chose car j’ai achete la mienne aux USA. Mais je suis sure que cela doit se trouver. Demandez peut-etre a votre boulanger? Juste une idee. Bonne chance et merci de votre visite! Sher, oh yes, I love mine too! Do not use it enough either! Hi! I have just discovered your site and I am entranced! As I read down through your recipes and tags I of course went to see what the Frenchwoman said about bread. I do make my own breads but I have yet to make an acceptable baguette. I see that you do not have a recipe posted. My baguette tasted very odd and yet was just flour, yeast and water. What do you use? I appreciate any help. Thanks and I love your site! I live in the Boston area- HiRise is very good! Also, try Flour Bakery in the South End. I recently went on a Sunday to try their brioches and they were fantastic! lovely looking bread..baking a bread is a joy for me.. I enjoy it…i call it a simple pleasure of mine,…have eyed your brick oven.. I started to make my own bread not so long ago. My kidtchen is just too small for one more machine. I find the no knead recipes easy enough. How do you use the cloche to rise your bread? In the oven? In the winter, my house is hardly warm enough to rise bread. Thank you for your insight and great blog. Actually I’m not a fan of bread machines.I do love to make my own bread,to knead(isn’t that relaxing? ),to bake in the oven and to eat.But along with my day time job,it’s time consuming.Therefore,I liked your idea so much that using the machine only to provide the warm environment for rising and then shape it and bake in the oven.Is it still working for you?Maybe I could buy one. Thank you..have a nice day.